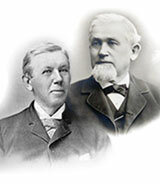 After working several years as a surveyor, William Gurley joined with his brother Lewis in founding W. & L. E. Gurley, one of the first manufacturers of precision measuring instruments in the U.S. As the country expanded westward, the creation of new states, counties, and townships required surveys and mapping. W. & L. E. Gurley was able to meet the growing demand for surveying equipment and established an unsurpassed reputation for high-quality products. The firm prospered and soon became the largest manufacturer of engineers’ and surveyors’ instruments in the U.S., and grew to international prominence. Gurley supplied instruments to major engineering projects and expeditions, including the Antarctic explorations of Admiral Byrd. During World War II, the company earned high honors from the Army and Navy for achievement in the production of war equipment. William Gurley served as a trustee of Rensselaer and both brothers were leaders in civic institutions in Troy. In 1983, the W. & L. E. Gurley Building, built in Troy in 1862, was named a National Historic Landmark.